public office in and outside the state, declaring that he is unfit to hold public office. 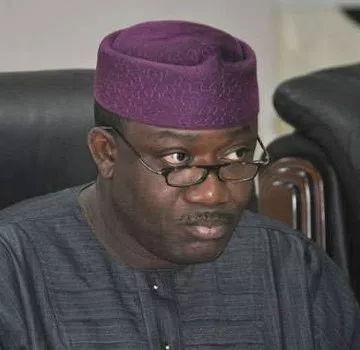 The government, which conveyed the decision in a white paper made public on Monday, also barred a former Commissioner for Finance in the Fayemi administration in the state, Mr Dapo Kolawole, from holding public office. The government said both men were barred from holding any public office for a period of 10 years. The white paper was based on the report of the Justice Silas Oyewole Judicial Commission of Inquiry into the Finances of Ekiti State during the administration of Dr Fayemi as governor of Ekiti State, which submitted its report the panel on December 13, 2017. 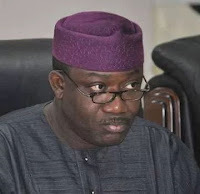 The white paper, while declaring Dr Fayemi and Mr. Kolawole unfit for public office, said: “Both Dr Fayemi and Mr Kolawole are recommended as unfit to hold any public office in the state for their refusal to appear before the Commission of Inquiry, even after the determination of the case challenging the inauguration of this commission of inquiry before the Ekiti State High Court. In explaining the decisions, Mr Ogunsuyi, who announced that the duo had been banned for 10 years, said “government views accountability and probity as the hallmark of good governance. Therefore, the government decided to set up the Judicial Panel of Inquiry in line with its law enacted in 2012. He said: “While we believe it is part of the responsibilities of the state administration to look into the finances of the state at any point in time, we are also of the belief that such must be done in a very responsible manner devoid of prejudice, witch hunting and a calculated attempt to victimise a citizen. “In his desperation, Governor Fayose chose the crude and ignoble path towards hitting a perceived political foe. In the process, they ignored the rule of law and behaved as if the court does not matter. Thus making their actions subjudice to the court. “Fayose was however misguided into believing that he could pass a death sentence on Dr Fayemi’s public service with the white paper. This is not only laughable, but ridiculous, as neither Governor Fayose nor his paid agents has the power to bar anyone from political participation. “The entire process and the character personae involved are discredited and since it is impossible to build something on nothing, legally speaking, their recommendation is not only null and void, it is ultra vires. “We urge the teeming supporters of Dr Fayemi, the good people of Ekiti State and the general public not to be disturbed by the development. It is simply another act of illegality, from an administration that has elevated political debauchery to state craft.